I have a lot to say, but I’m going to start with what has made me so “famous” in the Precious Metal community; having watched gold and silver tick-for-tick since 2002 – and regularly commented, for free, since 2004. M knowledge and understanding of the gold Cartel was learned from the best of the game, GATA’s Bill Murphy and Chris Powell, where I first started commentating. From that start, I took my natural curiosity, survival instinct, and deep analytical background (I’ve been a CFA, or Chartered Financial Analyst, since 1998; and spent 15 years on Wall Street, and five in mining industry investor relations, before joining Miles Franklin five years ago) to new heights – having tirelessly learned everything there is to know about the “taboo” topic few dare to address. Which is, the blatant, relentless manipulation of financial markets; particularly Precious Metals, given how damaging their strength is to “powers that be” aiming to maintain a status quo in which a handful of bankers, politicians, corporate titans and billionaires accumulate 99% of the world’s wealth and power, at the expense of the masses. Frankly, it is I that “discovered” – or at least, brought to the public’s attention, many of the most obvious Cartel tactics, going back a decade or more. For example, the “3:00 AM” and “DLITG,” or “don’t let it turn green” algos, which I recall writing of for GATA when I still worked at Salomon Smith Barney in New York, as an oilfield service sell-side analyst. Since I left Salomon in February 2005, they’ve clearly been ongoing for at least 11 years. For those that don’t yet realize the significance of April 2013’s “alternative currencies destruction raids,” they coincided nearly to the date of Ben Bernanke’s first utterance of the word “taper.” That is, when the powers that be, amidst an environment of collapsing economic activity (particularly in Europe); and relentlessly strong Precious Metal prices (despite two years of heavy-handed Cartel suppression); realized they must exponentially “step up” their market manipulation and propaganda efforts. To that end, after the infamous “closed door meeting” between Obama and the “too big to fail” bank CEOs on April 11th – one day after Goldman Sachs “coincidentally” issued a gold short sell recommendation”; for no particular reason, PMs were violently attacked on Friday, April 12th and Monday, April 15th – you know, like last week’s $1.5 billion and $4.7 billion COMEX-opening gold “market sell” orders; taking gold from $1,570/oz to $1,330/oz, and silver from $27.50/oz to $22.50/oz, and firmly entrenching them in bear market phases. Comically, the reason given for Goldman’s short sell recommendation was “our economists’ expectation for higher U.S. real rates” – as since, the U.S. CPI’s growth rate (data cooking suppression, notwithstanding), has risen from 1.4% to 2.2%. Meanwhile, the benchmark 10-year Treasury yield has plunged from 1.82% to today’s 1.54% – within a hair’s breadth of the all-time low of 1.34%, set last month. In other words, said “real rate” has since fallen, using the 10-year yield as an example, from +0.42% to -0.66%. 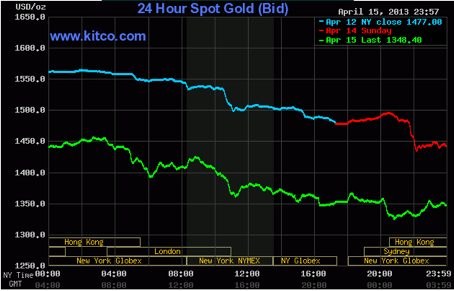 And yet, despite the Fed having achieved but one rate hike in the ensuing 3½ years – which nearly took the entire global financial system – gold and silver are down to $1,350/oz and $20/oz, respectively. Goldman’s “reasoning” was a pure, unadulterated lie – utilized to encourage HFT traders to “join” the Cartel’s raids; break technical support levels; and thus, justify the imminent monetary tightening propaganda. Anyhow, the reason April 2013 is so important is because it served as the “death blow” to the 2000-11 Precious Metal bull market phase, creating downtrends that took more than two years to be reversed overseas, and are finally on the verge of being retaken in U.S. dollars. Which, when it is, will unquestionably catalyze massive “buy stop” trade orders, which will equally, unquestionably cause dramatic gold, silver, and platinum price surges. 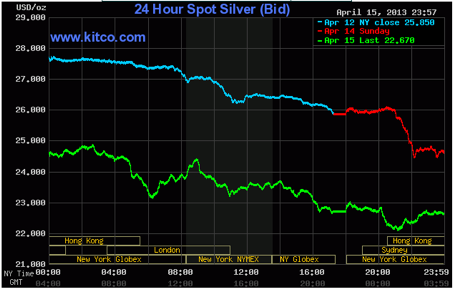 Actually, silver’s downtrend – which was far steeper – was retaken earlier this year at around $17/oz; whilst gold’s, which is far more closely watched by the global investment community, will be retaken about roughly $1,375/oz. Which just happens to be where the Cartel has “dug in” since the June 23rd Brexit vote – i.e., the “most important, and Precious Metal bullish, election in history.” And in silver’s case, it’s 50-month – not week, but month – moving average of roughly $20.45/oz. Well, here we are 3½ years later, and not only are global “real rates” at all-time lows, going lower each day, but economic activity has all but ground to a halt. Commodities and currencies have been obliterated – in many cases, to or below previous all-time lows; debt, of all kinds, has gone parabolic; Central banks have gone berserk, in monetizing tens of trillions of loans and financial market instruments – whilst covertly suppressing Precious Metals; and political regimes are collapsing, under the weight of the “99%’s” inexorably mounting anger. As someone who is doing better than most – but still spending each day worrying about my financial future – the depth of my violent hatred of the status quo, and thus, Hillary Clinton, should tell you all you need to know about the feelings of those doing “not so well.” Which sadly, is the vast majority of global denizens. In other words, things are about to get a lot worse, in lockstep with a dramatic surge in “rebellious” activities like voting for the Brexit, the Donald, and other anti-establishment concepts and candidates. Back to what I started today’s article with, is my desire to yet again, let you know that NOTHING is moving markets today other than relentless Central bank/government manipulations – of stocks, bonds, Precious Metals, currencies, and commodities. Not the yen/dollar exchange rate (the Yen is surging today, and yet PMs have been under relentless attack); not interest rates (rates are plunging today, yet PMs have been under relentless attack); not copper prices (copper is higher today, yet PMs have been under relentless attack); not “rate hike odds” (rate hike odds plunged yesterday, yet PMs have been under relentless attack), etc. Fortunately, said “bear market phase” decidedly ended overseas – due to plunging currencies – roughly two years ago; and here in the States, last December. Thus, such attacks – like late August’s summer doldrums raids have been massively unsuccessful, just as today’s will inevitably turn out to be. However, yet again, I need to emphasize that NOTHING matters in financial markets other than the battle between the eternally undefeated “Economic Mother Nature,” and the fraudulent manipulative forces of the desperately trapped rats we call “leaders.” So stop worrying about the Cartel, because it is becoming more toothless with each passing day. And don’t worry about the Yen/dollar, the VIX, interest rates, Fed jawboning, copper prices, biblical prophecies, solar flares, or web-bots – as NONE matter a whit, in a world where plain old economic reality is finally starting to overwhelm the manipulators. And particularly in the Precious Metal market, where the highest ever physical demand, the lowest ever above ground, available-for-sale inventories, and declining production growth as far as the eye can see will unquestionably destroy the Cartel in short order – likely, far sooner than even the most skeptical can imagine. That said, I don’t have time to thoroughly discuss a fraction of the past 24 hours’ myriad “PM bullish, everything-else-bearish” headlines. So instead, I’ll simply get to the gist of today’s principal topic – which is, that yesterday, in my view, we saw the “most damningly weak economic data in MOPE history.” And by “MOPE,” I mean the term Jim Sinclair created years ago, “Management of Perspective Economics,” to describe how governments – particularly the U.S. government – creates false memes by lying about economic data and manipulating markets to “rationalize” it. You know, like rising stock prices (despite plunging interest rates, commodities, and currencies), and falling Precious Metals. As noted above, since April 2013, when said “powers that be” realized their post-2008 money printing and market manipulations weren’t “working,” they have gone “all in” with such lunacy – which bought them a few years more of can-kicking, but destroyed the world far more thoroughly, whilst sowing the seeds for a far more dramatic Precious Metals bull market. Their worst fears are occurring right before our eyes – politically, economically, and socially; but particularly economically, as ultimately, money talks. And when economic data, like we saw yesterday, gets so horribly bad that even unprecedented money printing, market manipulation, propaganda – and data cooking – can’t hide it, you know the end game is upon us. 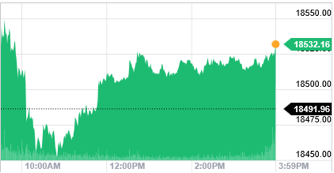 To wit, yesterday’s horrifyingly weak, massively “unexpected” plunge in U.S. economic data, across-the-board. Starting with yet another collapse of the Fed’s own “Labor Market Conditions Index” to negative territory, just one day after an equally horrible jobs report; followed by the Gallup U.S. Consumer spending index plunging from 100 to 91; and the ISM’s August Non-Manufacturing Index careening from July’s 55.5 to 51.4 in August, when it was “expected” to be unchanged. In other words, utterly destroying whatever remains of the massively failing post-April 2013 mope campaign – just as Precious Metal prices are surging in all currencies, as the annual Fall “witching season,” which promises countless, dramatic political, economic, and monetary catalysts, begins. LOL, as I write at 9:05 AM EST, after an entire morning of relentless raids, gold and silver are exactly at the Cartel’s current, blatantly obvious “lines in the sand” of $1,350/oz gold and $20/oz silver; just below the aforementioned ultimate lines in the sand of roughly $1,375/oz and $20.45/oz. Of course both will be re-taken – in my view, very shortly; and when they do, it will likely represent the symbolic end to the most destructive, futile MOPE attempt in global history. And likely, the simultaneous collapse of history’s largest, most destructive fiat Ponzi scheme! Thanks again Andy for a very encouraging blog entry. Probably like many of your other readers, I need the pep talk more than the facts, even though encouragement must be supported by truth. I started stacking in late 2008 and have been all in for a few years, but even though intellectually I am very comfortable with my position, emotionally it seems that TPTB can do the impossible indefinitely. My stomach turns every time I see that the house of cards remains standing no matter what fraudulent outrages are revealed by the news each day. After a while resignation and defeat creap in, even though I know I am in a winning position. I know that no expert can predict the timing of the cartel calapse, but I have been trying to devise some sort of a simple indicator that would tell me when the cartel power is weakening. So far I have failed. But, reading your blog has provided some of the emotional comfort I am looking for. If I could chart the urgency in your tone, I think it would be the indicator I have been seeking. I should add, the emotion I am speaking of is not fear. It is outrage and a desire for vengeance against the sociopathic maniacs that have been fooling us for over a hundred years. Sorry to say, I was late to wake up to the scheme foundationally supported by fractional reserve banking. Maybe there are other readers who share my circumstance? Hi from over the Pond in London, and Brexit land. I would equally like to thank you Andy for your tireless efforts. Believe me we need sound minds and firm voices like yours. I have wanted to voice the same thoughts for some time, thanks Victor. They seem able to carry on for ever. I feel it’s because it’s the entire Western world plus Japan and China, doing it together. They are not talking to each other I feel sure, but each awful step they take must be similar, as they have only ‘printing money’ and crazy manipulations using it, left in their arsenals. But also, when it does end, our lives will be radically changed and we will face an awful period of poverty and distress. Heaven help us all. Why don’t the P.M. miners unite and set the price of their wares at a level where they would make a fair, yet profitable profit, and completely ignore the COMEX? Same as farmers. The price of eggs and milk is so low I don’t see how they survive.